Last week in Nairobi, over 700 people gathered to discuss how information and communications technologies (ICTs) are being utilized around the world to accelerate achievement of the global Sustainable Development Goals (SDGs). The annual ICT for Development (ICT4D) Conference hosted by CRS, NetHope, and others, highlighted the role that ICTs play in delivering critical services across a range of sectors, informing policy decisions, as well as improving monitoring and evaluation. At ICT4D, many non-profit organizations and aid institutions described how their operations, and thereby their impacts, improve with Internet access. But many of the organizations also noted that the dominant models of access do not suit their or their customers' current needs. In fact, nearly four billion people worldwide are not connected to the Internet because of a range of issues, including lack of availability (no Internet infrastructure in their geographic location) or unaffordable access. Extending connectivity to those individuals, and the organizations supporting them, requires concerted effort and innovative thinking on the part of development agencies, governments and the private sector alike. For example, the Human Needs Project at the Kibera Town Center in Nairobi provides a range of basic services (such as clean water, toilets, showers, laundry) as well as training, employment and skills development. John Gage, the Chief Science Officer for the project, shared how Internet access improved the delivery of these services, and the Center connects via low-cost commercial Wi-Fi from a fiber access point. In Mukuru, another urban settlement in Nairobi, the Red Cross has pioneered a system of connected sensors to accelerate live-saving responses to fast-moving fires. Fires can spread quickly in densely populated urban slums because of the use of open fires to cook, burn trash and keep warm. The Red Cross and its partners developed a low cost fire detection solution deployed in family dwellings that can detect a fire and send alarms across the entire connected network via LoRa and text messaging. 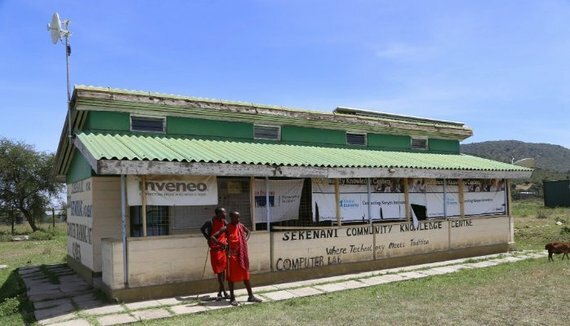 Further afield in northern Kenya, a local Internet service provider (ISP), Mawingu, is providing low-cost Wi-Fi Internet service in an area without wireless macro cellular connectivity. Mawingu uses long-distance Wi-Fi for its backhaul network infrastructure from one of the many fiber points of presence (POPs) in Kenya. The company has also pioneered the use of TV white spaces (TVWS) in the local access network, which is currently used for students' Internet access in local schools. Each of these examples shared at the conference highlights innovative business and technology models to extend Internet connectivity. A new report launched today by USAID, mSTAR, FHI360 and SSG Advisors, "Business Models for the Last Billion", goes even farther to describe a range of innovative, low-cost business models to connect the unconnected. The report highlights developments in back-haul network infrastructure, ISP business model innovation providing service to those in the base of the economic pyramid (BOP), the rise of low-cost Internet access devices, locally-relevant content, complementary services offered to BOP customers (such as charging stations) and effective policy and regulation to extend service. While highlighting that innovative companies servicing the BOP have emerged, the report identifies the significant challenges that remain. First, existing models of delivering Internet access have their limits, hence the need for other innovative business models and service delivery mechanisms. Second, "existing models have succeeded at a relatively small scale but face a lack of early-stage financing, limited partnership opportunities, and unfamiliar or restrictive regulations." And finally, to scale these innovative solutions, partnerships will be needed to "bring together the large set of diverse organizations with an interest in universal connectivity." It is important to note that the sharp rise in Internet adoption in low and middle-income countries has been achieved in strong part by the spread of mobile broadband via macro cellular connectivity. Already over 90% of the world's population is covered by 2G mobile signals, and over two-thirds is covered by 3G connectivity which provides sufficient bandwidth for rich Internet browsing and video streaming. But to further increase adoption, partnerships such as the Alliance for Affordable Internet (A4AI) as well as the Digital Impact Alliance (DIAL), are focusing attention and effort on the policy issues and the digital tools needed to expand Internet access. As the global community coalesces around major efforts to extend access to every person on the planet, such partnerships will be key to ensure coordination and complementary action. The ICT4Development conference last week and the new report launched today stress the importance of ICTs and reiterate the need to expand Internet connectivity for global development.